Bitdefender Safepay is a security module which offers a safe environment for running online transactions, generally this module will be available as part of Bitdefender Security products, now the security firm Bitdefender released Safepay as a standalone desktop application. Bitdefender Safepay is available in two versions: Free and Premium, when compared to free version, the Premium has only one extra feature called WiFi Hotspot protection, which protects your Wifi connection and prevents hackers from accessing to your Wi-Fi connection and tracking your online activities. 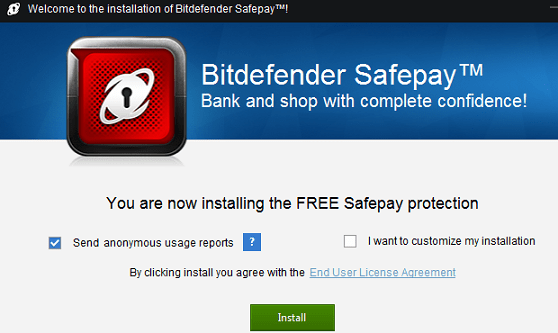 Leaving the premium version aside, Bitdefender Safepay free version is helpful especially if you are frequent online shopper and using a free antivirus solution on your system. The Safepay app works along with any antivirus solution, according to Bitdefender, the app provides safe online banking and e-shopping . All over the Internet, malicious applications are created to access online accounts and steal important information. Keyloggers, for example, are pieces of software that track your keystrokes or execute automatic screenshots of the locations you access.Bitdefender Safepayprotects you against these applications, using Bitdefender’s cloud technology the app thwarts Keyloggers, phishing attacks, and viruses to ensure a safe and trusted online experience. Irrespective of the developer’s description, at the end Bitdefender Safepay application is nothing but a desktop browser that provides secure browsing environment. Although you may find several add-ons for your favorite browser that offers similar security feature, but SafePay app is different, it creates a sealed environment, shielded from third party intrusions and uses technology that is available in commercial security suite. Not only this, Safepay browser has a self-protect mechanism, to prevent unauthorized modifications to your PCs files and processes. Also, I have to mention that while using the app, I was unable to take a screen shot of the browser through windows inbuilt screen shot function and Snagit app. So if you want ultimate security for your sensitive data, like a credit card number or account number during online banking and shopping, then Safepay app will be very helpful. Bitdefender Safepay (online) installer is around 5 MB, on launching the installer it further downloads few files (don’t know the size of these files, but requires good network speed) and will install the application. 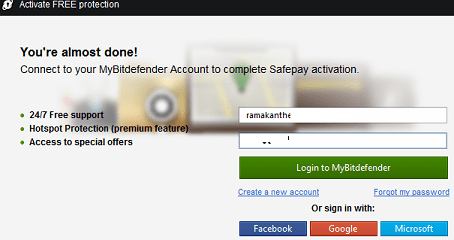 After installation, run the app and login with your previous Bitdefender account or through Google account. When you launch the Safepay app , it will black out your desktop screen and starts scanning for a certain type of malware, which according to the app’s description once this malware infects your computer, it will comprise any activity you perform on your system. Every time you launch the app, this Scanning process will appear on your desktop screen, but it’s a matter of few seconds. Once the Scanning is finished, you will see a full screen browser that provides a Sandbox type secure browsing environment. Now you can use the browser for your online shopping and bank transactions, but don’t expect faster browsing like Chrome. Also don’t use this app for your normal browsing activities as it’s a basic browser with few features like bookmarks, printing and tabbed view. If you have finished your browsing or you want to see your desktop, just Click Switch to desktop icon in the upper left corner of the browser and to return to the Safepay browser , click Switch to Secure Desktop in the upper right corner of your desktop screen. Further to make your online transactions more secure you can use Virtual Keyboard, you can access the Virtual Keyboard in the browser located on the left side of the URL field.